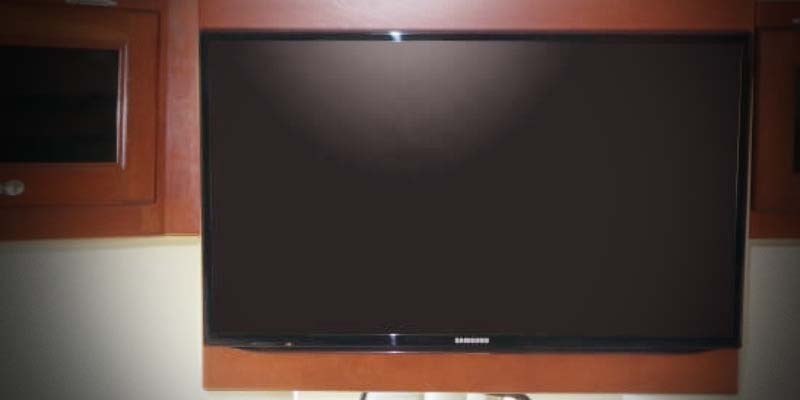 Are you ready to replace the heavy, old TV of yesterday with a new flat screen, high definition TV? We can help you. 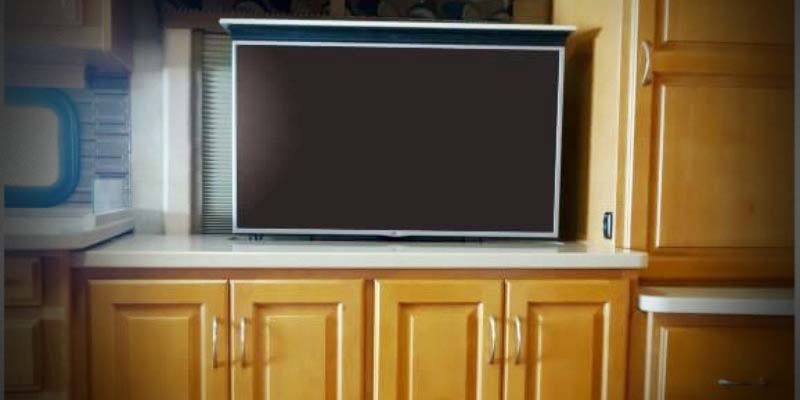 Whether you are replacing the front TV, bedroom TV or want to go to the ultimate with our Televator TV lift cabinet, we have got you covered. 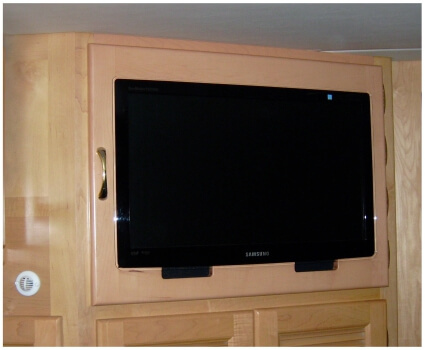 We can custom fit any brand of television into the available space and the mounted TV will be secure and beautiful. 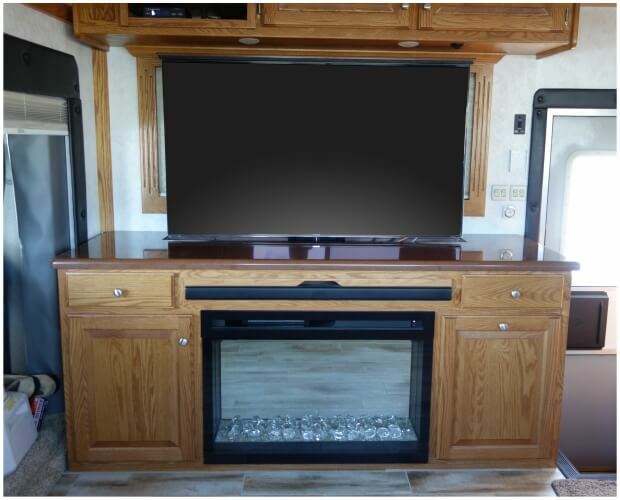 We custom match your wood species and color and will have your coach updated in a matter of days. 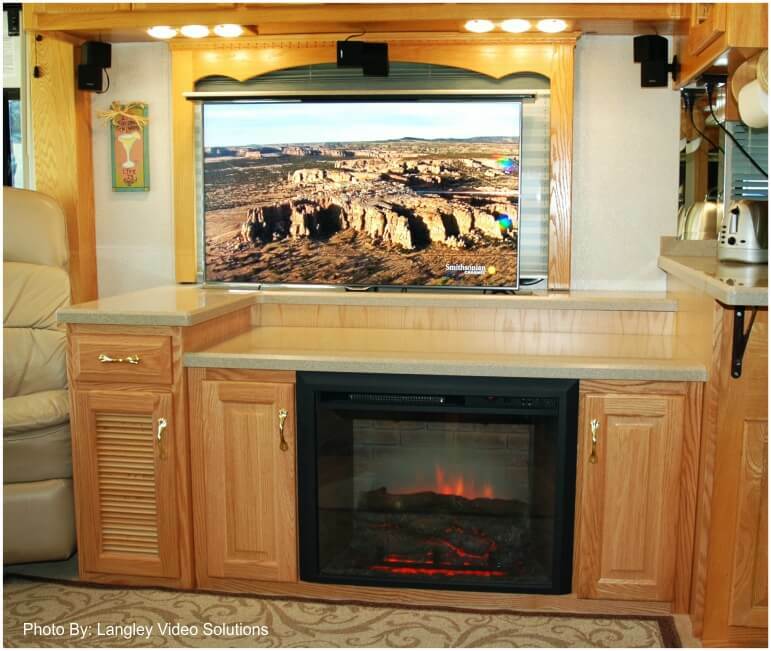 A new level of home entertainment has arrived! 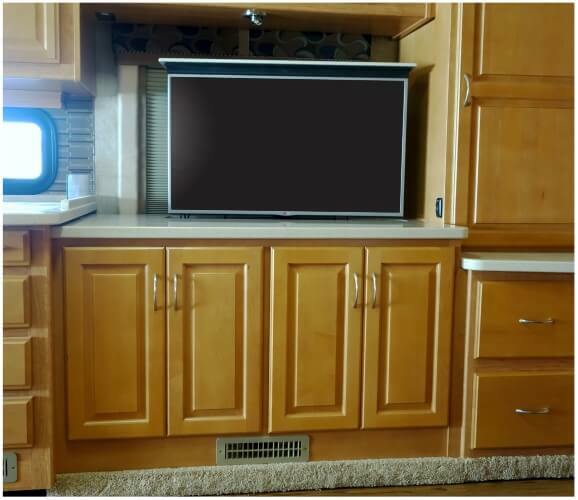 The Televator TV Cabinet features a TV mounted on a super quiet, motorized lift that will extend for quality viewing and then will disappear to provide a nice, clean look and additional counter space. 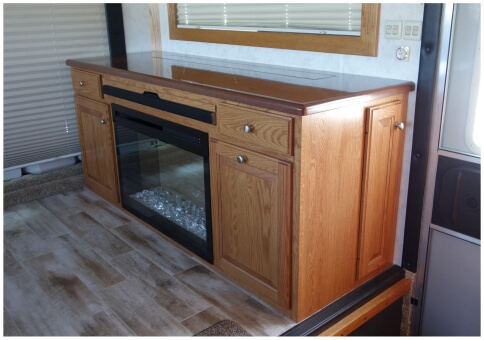 Add a fireplace to the front or use the space for components and other storage. 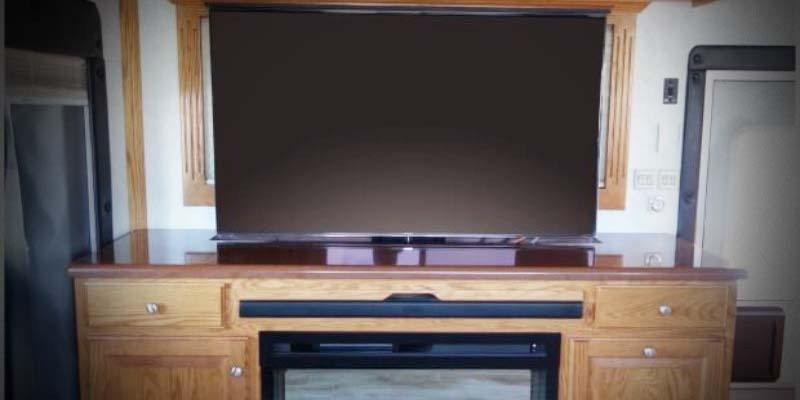 Up to a 60" TV can be mounted on the lift. 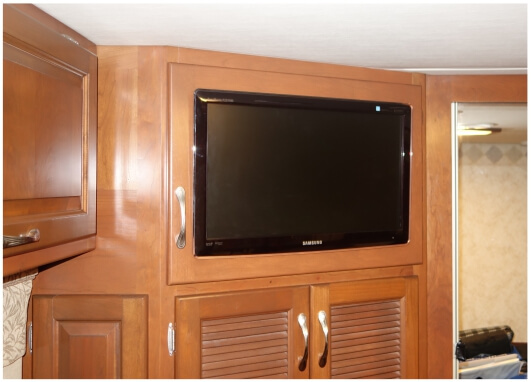 Another example of the Televator TV in a smaller more compact cabinet. 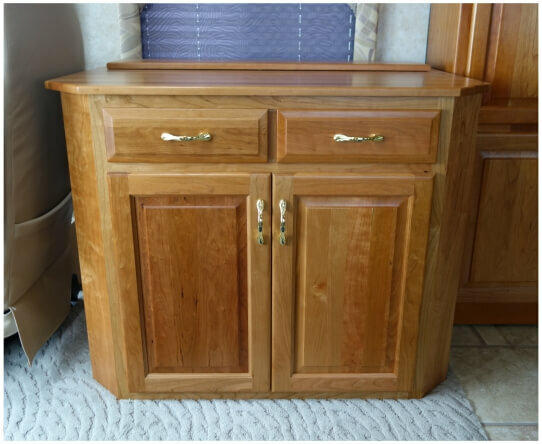 It features 2 drawers and doors with adjustable shelves and a solid Cherry hardwood top. 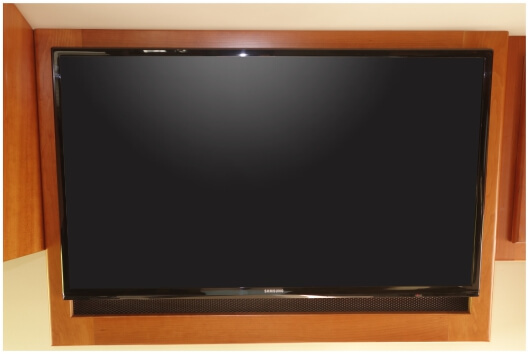 The bedroom TV door is our standard installation for bedroom TV replacements. 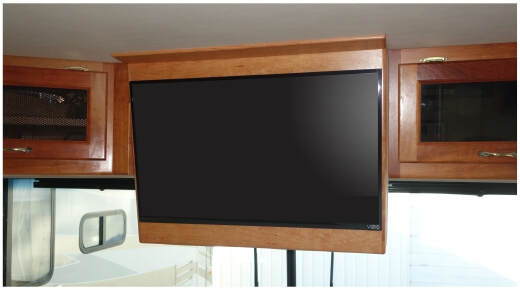 It features a frame that is custom built to fit the TV and mounted on hinges to match your existing hinges. 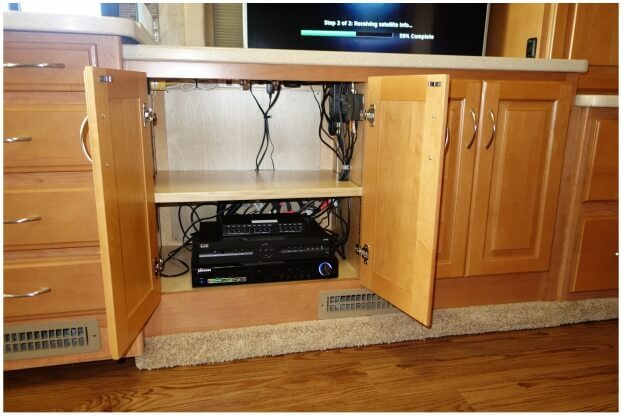 It is a great way to open up lots of storage space made available by removing your old TV. Give us a call and we'll help you make space for your next shopping trip! 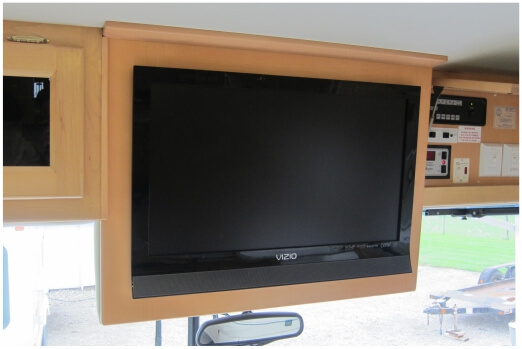 This coach had an extra wide cabinet, so we were able to use a 32" TV and still do a side swing door. 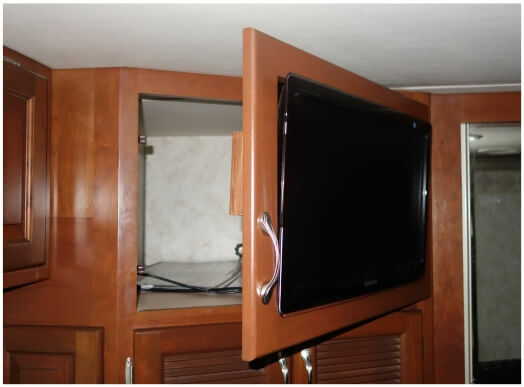 It opens to allow easy access to the wiring and to utilize all the storage space opened up by removing the old heavy TV. 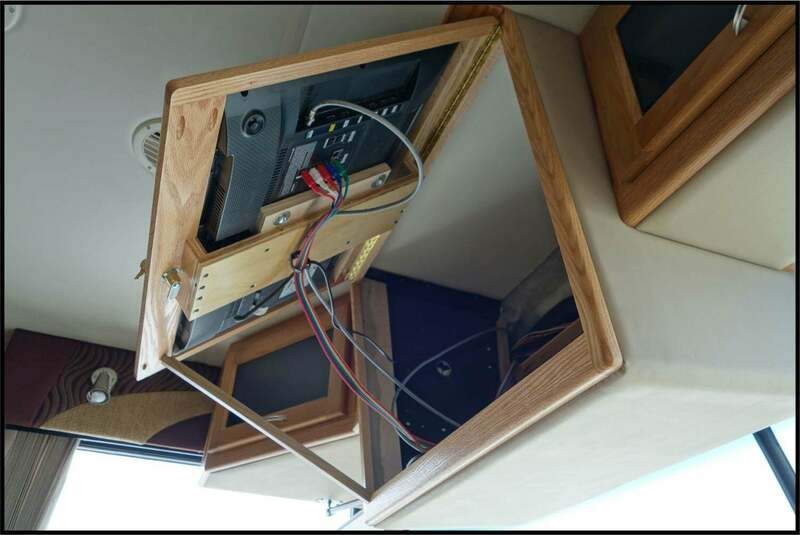 Tired of your old heavy TV squeaking and rattling above your head? Or maybe you're afraid it will fall out someday and do some damage or worse yet, knock you out! 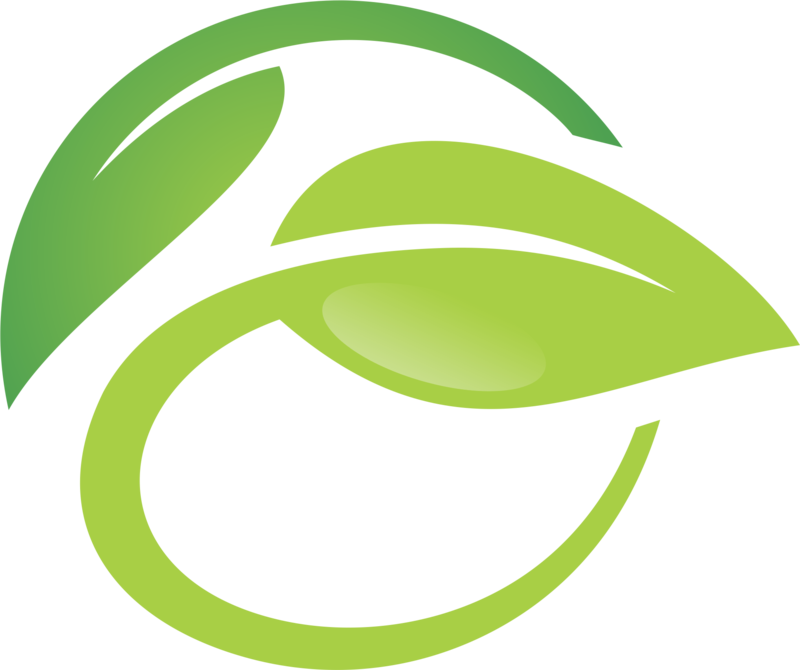 We can take care of your problem. 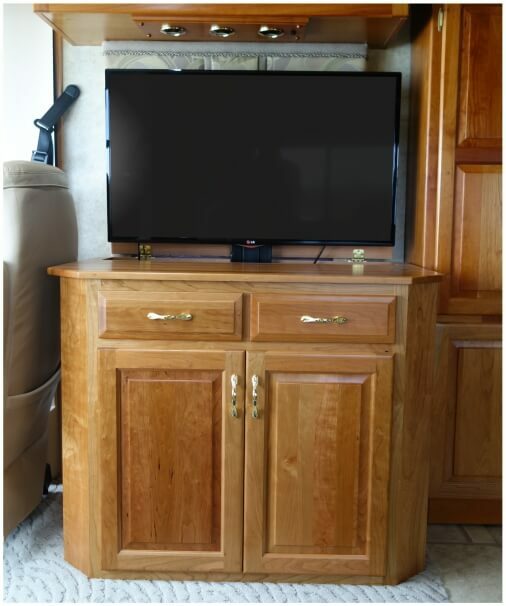 We can custom fit any brand of 26" to 32" TV into the existing cabinet and we can match your wood color and decor in the process. 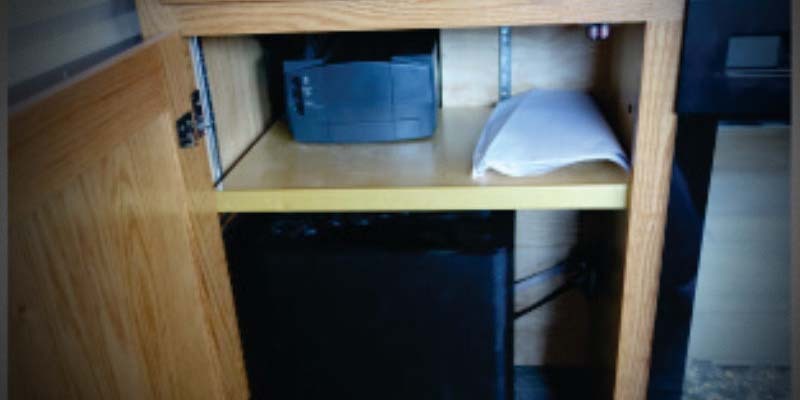 Have a cabinet that sticks out too far and you hit your head when you walk up the stairs? 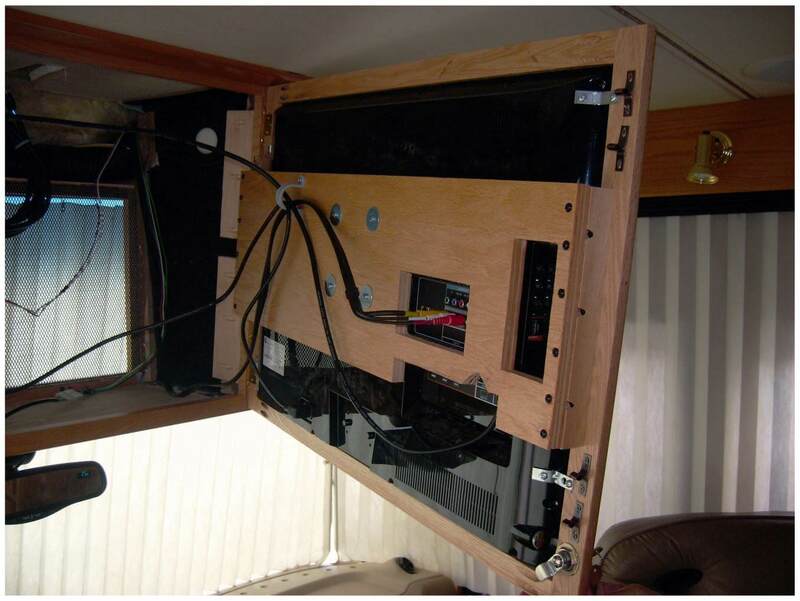 We can take the existing cabinet and modify it to be smaller and lighter and eliminate the head banging. 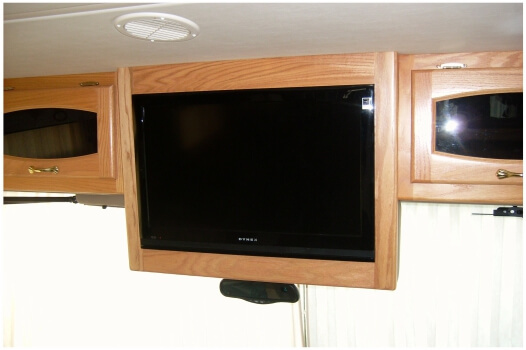 We can also cut it off the front (windshield) to allow you to install a one piece roller shade. 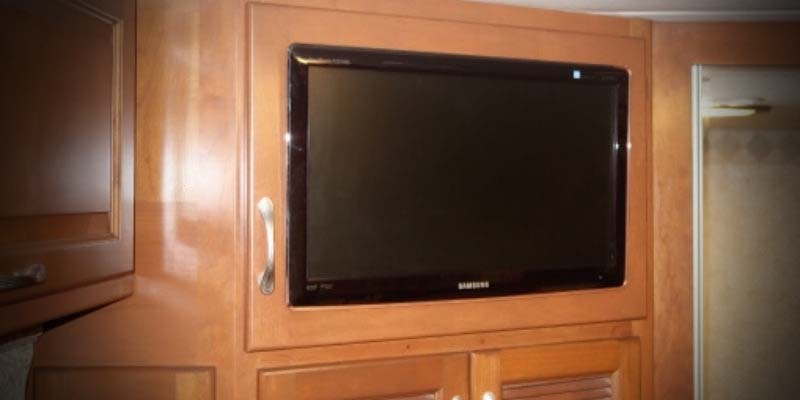 This Televator cabinet brings a new meaning to customized and full featured! 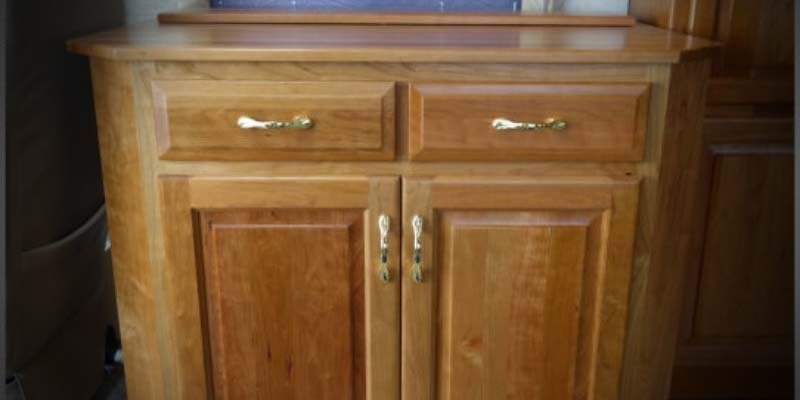 It was designed in coordination with the customer. 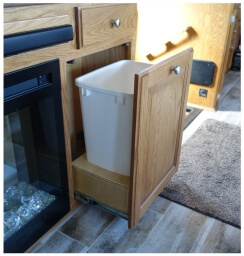 It features a pullout wastebasket on the right side, a fireplace and miscellaneous storage cabinet on the left. 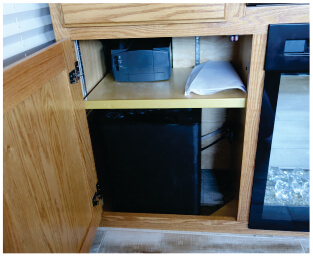 Also has two drawers on the top and a wireless soundbar speaker above the fireplace. 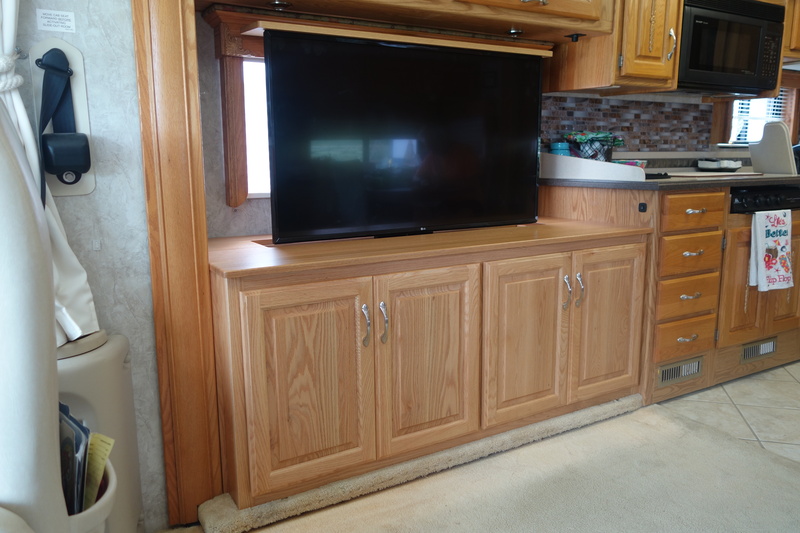 The right end of the cabinet was dead space so we put door on and utilized it for the storage of smaller items. 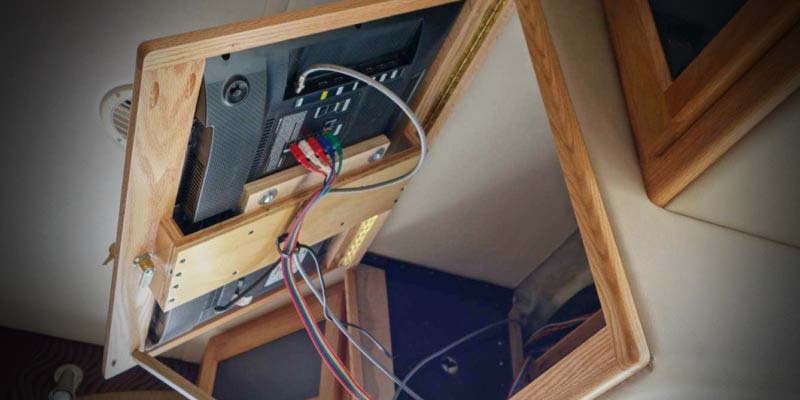 The TV lift has a remote and a manual switch included.